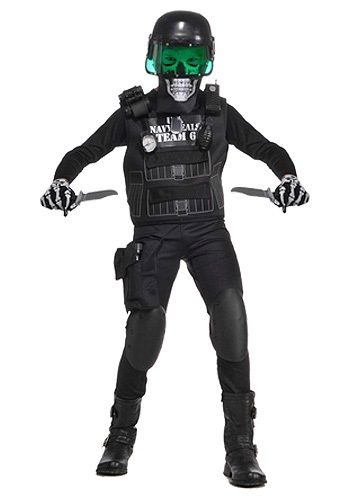 I like it, its a decent costume for the most part but it's shown with skeleton gloves and it doesn't say that you have to buy those separately like it does about the boots. Overall it's a good costume and was delivered quickly. Received this costume, everything was great except the helmet was broken. My son likes it but a little disappointed in the mask. The helmet fits my small 10yo son just fine as does the very thin jump suit. The knee pads are just round cloth with elastic that is too big but can easily be fixed. My son loves it - esp. the weapons that can be velcroed to his vest. He looks just like the picture. The one drawback is that the skeleton mask is actually a little, tiny handkerchief that only covers the nose and mouth. My son wasn't too disappointed (bc he likes the weapons), and I actually prefer it b/c he can wear the kerchief to school (no masks allowed) and he will be able to see well while trick-or-treating. Overall, son is happy so I give it thumbs up. I return this item, the size is too big for kids size and the quality is very poor, is overprice and the helmet coming in bad shape and the packing broken, really disappointment with this store.